I have around 700 Blogs with High DA PA Blogsof All Categories..!! 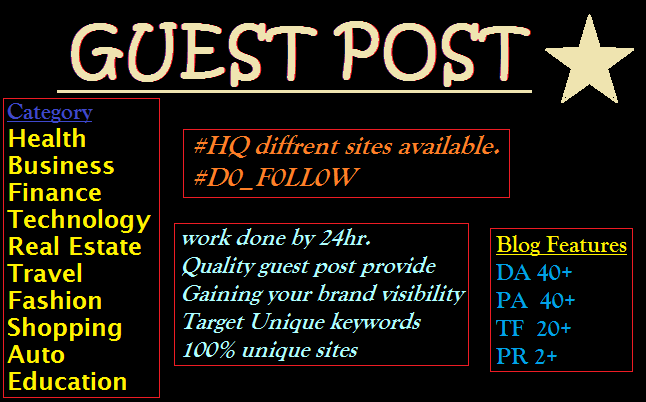 You will get Permanent Post on my Blog..!! You will get (2-3 dofollow backlinks) & (2-3 juiceful images related to article) each Post..!! If you need to write contents from my side then i will write original, informative, high quality, relevant, and well-researched Contents to meet Google’s SEO standards..!! I'll share your Post on twitter, Google+, facebook and many other social media sites which will help you to popularizing your website in turn results in increasing the visibility of your website..!! Guest Post On High Authority Blogs With All Category is ranked 5 out of 5. Based on 1 user reviews.